This is a 21-year old property. The original design was a bit '80's dated, even when it was built, but didn't look all that bad, and more recent exterior renovations have not been an improvement. Present appearance, after a coat of Tammy Faye stucco . . .
Parkersburg has two easily identifiable submarkets, not an unusual layout for a small city of its size. You have the hotels out on the I-77 corridor as one submarket, you have the hotels in the city itself as the other. This property is in the city. Those properties out on the interstate are going to be much more I-77 dependent and may drag your rates down a bit, but the Parkersburg area is not that isolated, and Wood County has more outlying demand generators. Any property located in the town itself is going to be more dependent on pro-active sales and marketing. This can offer great success -- the Hampton Inn and the historic Blennerhasset Hotel are both located in this submarket -- but it's going to take a little more work. This is particularly true for this property, because visibility from a traffic artery is going to be a problem. This property is located in Parkersburg's uptown retail area, within walking distance (a half mile, if you don't mind walking) of a respectably-sized regional mall with the grandiose name of Grand Central Mall. It's within walking distance to several restaurants, something that is lacking by comparison for its main competitor, the Wingate by Wyndham in Vienna. It is one of two Class A properties proximate to Ohio Valley University. A smart operator would take care to cultivate a close relationship with OVU and its secondary demand generators, and use the hotel's convenient location to its advantage. One disadvantage that it has is that it's located a bit back off Route 14/Murdoch Avenue, the traffic artery that runs in front of it, and visibility is a challenge that must be managed. The property appears to be in pretty good shape. Most of the renovations we'd do here would related to conversion of the property to the Red Lion brand and bringing it into line with their standards, should we convert the property to a Red Lion Inn and Suites. Added care should be given to ventilation, and the PTAC units in the rooms need to be checked: several people note this to be a problem. Some minor mold remediation may be in order. Any non-working or noisy exhaust fan in a bathroom needs to be replaced. If the mattresses are more than a year old, you need new mattresses -- that's how long now TripAdvisor hits on the mattresses have been showing up. Security needs attention: loitering in the parking lot, even by comparatively harmless but noisy drunks, doesn't work. Some TripAdvisor reviews of this property indicate a need to tighten up housekeeping and room inventory control. Housekeeping should be tightened up anywhere, but possible excuses for a guest to be checked into a dirty room are rare, if the housekeeping and front office staff are working together as they should be. I generally don't recommend a full time director of sales and marketing for a property this small, but in this location it might be listenable. You're not going to shag a lot of traffic off I-77 with it without some severely discounted Exit Information Guide coupons, and visibility is a problem if you are in that part of town. Nonetheless, it has the best raw location of any hotel in the Parkersburg area -- but if you want the business, you're going to have to go out and get it. For now, marketing at this property needs a fresh look, and it shows in its current performance. The average daily rate claimed by the broker is $82.70, the rack rate according to the Choice Hotels website is $139.00. I know they're coming off a bad year, with two new hotels opening in the area within each of the last two years, and they seem to be recovering a bit, but we've been seeing too many $67 rates on TripAdvisor and its online travel agency affiliates recently. 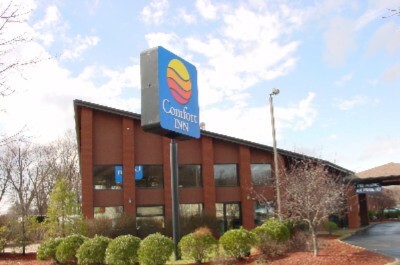 Nonetheless, we're pretty clear that the Comfort Inn brand is not working at this property. 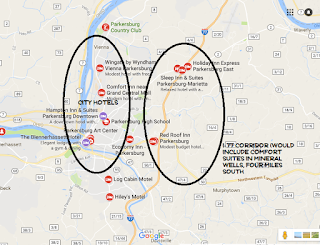 Choice Hotels' franchises are oversold here, as they are in so many places: they now have more hotels in Parkersburg than they are able to support -- but hey, whatever keeps the fees and royalties rolling in for them. That new Sleep Inn out in the I-77 corridor that opened two years ago did not help, and a Comfort Suites in Mineral Wells draws a lot of Choice-generated traffic. The cumulative effect is that all three of these properties are not well-served by Choice, and their rates lag competitively, and they underperform. We recommend conversion of this property to a Red Lion Inn and Suites. 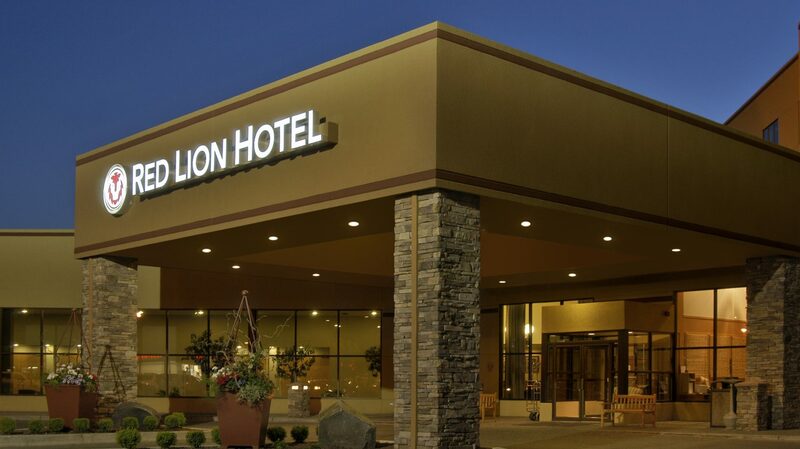 As a Class A mid-market brand, Red Lion is gaining in competitive strength, while Comfort Inn has been in decline for more than ten years now. Red Lion also has a historic willingness (and in the eastern United States, a present, pressing need) to accept an older property as a franchisee and -- assuming you renovate and keep it up in accordance with their standards -- make it possible for that property to compete against any Class A property with a first-tier franchise. Red Lion isn't going to hand success to you on a plate, but Choice Hotels clearly isn't; and unlike Red Lion, Choice has proven it already. If you want success that comes in a 'kit' you can buy, sign up as an Amway distributor. It's only going to happen for you at this location in Parkersburg only if you have strong local marketing -- but we anticipate and assume that with any hotel franchise, even first-tier franchises like Marriott, Hilton and IHG. We have no affiliation with Red Lion. (Over the last year, some people have started to wonder if Beechmont is getting to be the Red Lion guys, because recently we've come to recommend them frequently). What we like about Red Lion is that you can build a brand new one and stand it up against any Hampton Inn or Holiday Inn Express -- or take an older property such as this one, renovate it to pristine condition, and re-flag it as a Red Lion, and it would fit right in without having it make your new property look bad. The "older" look fits right in with the quirkiness. I see little about this property that makes it worth more than three times its gross room revenue: its location is compensated by its lack of visibility, its next to worthless Choice Hotels affiliation, and its aging appearance (which its visit a couple of years ago by the ghost of Tammy Faye amplified, rather than rectified). Its location -- once offset by its flaws and failings -- is good for a premium of, at most, 3.1xGRR if you pay it a visit and find no further problems, and it's been sitting on the market for several months. Offer $3mil and see what they do. Be prepared to go as high as $3.2mil, but only if they agree to deliver unencumbered by franchise and unencumbered by management. You'll want a sharp, aggressive, think-outside-the-box salesperson, even if it's someone that only works part time. The only thing trying to manage it by committee is going to do for this property is add to the overhead, and have the various members of your "management team" getting in each other's way. 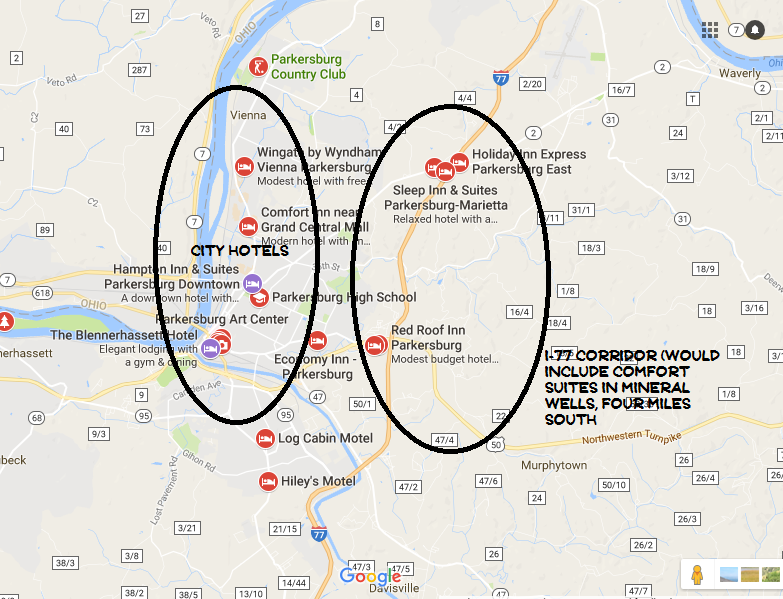 If you currently own or operate a hotel in Nashville, Montgomery, Ala.; Searcy, Ark., Abilene or Lubbock, Texas; Camp Hill, or Harrisburg, Pa.; Covington, Ky.; Wilkes-Barre-Scranton, Pa.; or the Minneapolis or Phoenix area; you should consider a Parkersburg property, especially if one of more of your current properties is getting corporate or group business from one of the companies previously mentioned. Without the marketing skill and the ability to reach out to corporate and group customers, this property is going to continue to perform below its potential. If you are contemplating purchase of a hotel, or if you are a hotel broker, and would like for us to complete an evaluation similar to this for you for the hotel that you are considering, send a PayPal for $100 at makeitrain18018@gmail.com .